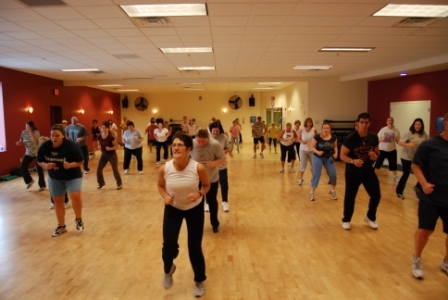 Regular attendees of Zumba fitness classes in Foxboro, MA are bound to reap the benefits of improved health through engaging and energizing dancercises. If you know about Zumba you probably know that it is similar to a dance floor in a popular club on a Saturday night. This explains why Zumba is one of the most popular fitness programs today. Zumba fitness classes boast catchy dance music, easy-to-follow dance exercises, lively instructors, and loud hoots and cheers from participants. This class offers various styles of Latin American dance routines performed to upbeat music that makes you tap your feet and get up and dance. Zumba fitness has become a trendy workout across the country. It prefers no age, gender, or fitness level so everyone can join this fitness class and enjoy the many different benefits. A lot of people choose Zumba for weight loss but this is not the only benefit. It is considered a full-body workout because it engages all the muscle groups in the body in one routine. So aside from it is effectiveness in burning calories, Zumba is also advantageous for toning the body. Regularly performing Zumba keep the heart healthy and prevents health conditions such as diabetes and high blood pleasure as well.